If you'd told me a few years ago I'd be using a moisturiser every day, in fact twice a day, I'd have laughed. Before I started blogging I knew pretty much nothing about skincare, my skin was super oily so I logically thought it didn't need any added moisturiser. How wrong I was. Of course even oily skin, in fact, especially oily skin, needs moisturiser. My skin was so dehydrated and crying out for moisture, and therefore compensating by producing more oil - not good when you have serious acne to contend with too. Fast forward a few years and moisturiser is a firm must for me. I think the course of Roaccutane gave me the kick up the bum I well and truly needed. 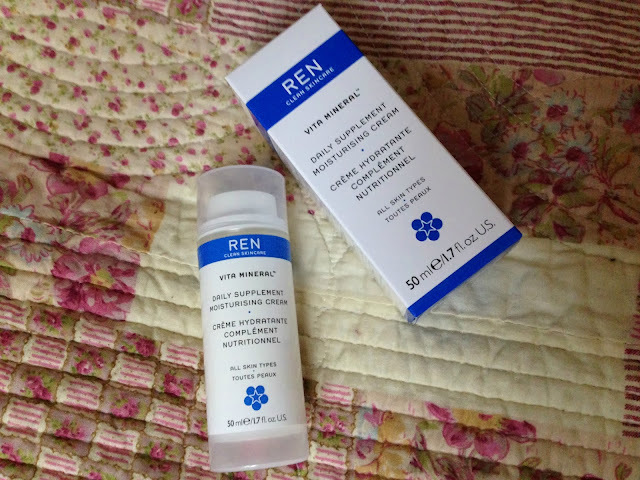 REN Vita Mineral* moisturising cream is the perfect consistency for me and certainly made for my 'normal' skin-type. The cream isn't thick and heavy and isn't too light either, you can really feel it sinking into your skin and preparing your face for make up. The scent is a subtle rose scent, not over powering but quite soothing, which again I like. REN use no parabens, sulfates, mineral oils, synthetic fragrances, etc. there are no nasties to clog our pores, which is a huge plus for me and certainly converted me to this gorgeous brand. I need more REN products in my life asap, love. Check out more about the Vita Mineral here. i am always in need of a good moisturizer for the winter! great review! My skin is so dehydrated too, I work from home & have my central heating on all the time atm so my skin is suffering. This REN cream sounds like a winter saviour.